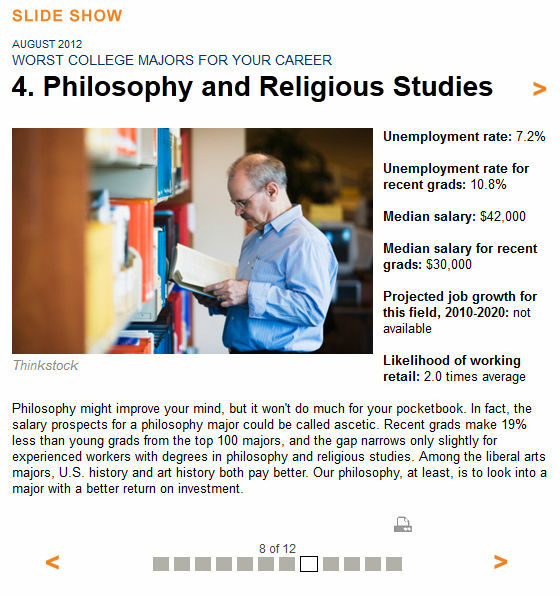 I’m not sure what’s more interesting: that not a word of the brief write-up even mentions the academic study of religion (it is simply folded into Philosophy, as it is on many US campuses, where small Philosophy/Religious Studies programs approach religion as being about faith or belief and thus an apparently natural partner for those who are invested in pursuing/perusing the disembodied the life of mind) or that the only scale of value that seems relevant is the financial pay-off to an undergraduate degree. Or maybe what ought to catch our attention is the way that the article fails to see that, for the past few decades, a variety of factors have conspired to ensure that, in many cases, an undergraduate degree is now merely a first step toward other skill/career preparation–what achieving a high school education once was. As intriguing as all this is, I’ve decided that the most interesting thing about this article is that many of my undergraduate students could do exactly what its author, Caitlin Dewey, (a recent graduate from Syracuse University with a major in magazines) did in writing it. For they can carry out research, read, sift through data, generalize, and summarize. Heck, I’ve even taught some how to use Dreamweaver and work with html code. (I know just enough to be dangerous–but don’t ask which version of Dreamweaver I use…) But they can move from there to do so much more, such as the sort of original analysis and argumentation that persuades readers why they ought to care about the topic under consideration–rather than just presuming, as this article’s author does, that earning potential is a self-evident measure of worth. So, come to think of it, I’m rather pleased that Kiplinger published this piece, because I can now use it to show my students the sort of work they can already do, and do even better than the people who are now doing it to earn a living. I wonder what Caitlin makes writing these–what shall I call them?–abstracts? Coz my students should be earning more. This entry was posted in Faculty Blog, Relevance of Humanities and tagged career, Kiplinger, Philosophy, salary, skills by Russell McCutcheon. Bookmark the permalink.